A: Pours a super murky pale yellow in color with moderate amounts of active visible carbonation rising along the edges of the glass and moderate amounts of pale golden yellow colored highlights. The beer has a finger tall sudsy bright white head that quickly reduces to a couple of small patches of thin film surrounded by a large patch of very thin film covering the remainder of the surface of the beer and a thin ring at the edges of the glass. Moderate amounts of lacing are observed. S: Moderate to strong aromas of tropical/passionfruit, citrus/grapefruit, tropical/mango, and stone fruit/peaches over the top of light to moderate aromas of biscuit malts with a light amount of caramel + simple syrup + honey sweetness. T: Upfront there is a just shy of moderate flavor of biscuit malts with a light to moderate amount of caramel + simple syrup + honey sweetness. That is followed by moderate to strong flavors of juicy tropical/passionfruit, citrus/grapefruit, tropical/mango, and stone fruit/peaches which impart almost no perceptible bitterness and leaves a lingering fruity hoppiness in the finish. M: Medium bodied with moderate amounts of carbonation. Initially crisp with a light amount of dryness in the finish. O: A really easy to drink and enjoyable NE IPA - fruity and juicy with a minimal amount of bitterness. Alcohol is extremely well hidden and I could easily have a couple of these. Batch 1 on the bottom of the can. My can pours a cloudy yellow with an inch of foam. There's some spotty lacing. The smell is diverse and complex. Initially with quick whiffs I get mostly grapefruit. Slowing things down, I notice some pine, pineapple, mango, oranges..very fruity IPA indeed! Taste wise, grapefruit and oranges take the forefront with the pine etc being supporting players. That will probably change as the beer warms up. And they do. From the CAN: "You better lose yourself in this IPA, the moment. You own it, you better never let it go." I Crack!ed open the vent & began a slow, gentle Glug into the awaiting glass. I was unpleasantly surprised by both its slightly hazy appearance & the tropical fruit smell that was already beginning to emanate from the beer. I am not a fan of hazebro AIPAs & since they do not fit the style guidelines, I am always a low outlier in my ratings. In its favor was the fact that it puffed up with a dense, foamy finger of bone-white head with very good retention. Color was a slightly-hazy Yellow-Gold (SRM = 4 -5). Nose was a sweet tropical fruit salad mélange. 8=p Where is the bitterness?!? This is NOT my idea of an AIPA! Mouthfeel was medium-to-full. not quite creamy, but on the approach. The taste was the usual tropical fruit suspects of mango, guava, papaya & passion fruit, but this is NOT what I expect in this style. I was especially disappointed since there was nothing on the label to alert me to its taste. Finish was semi-sweet, very fruity, but also very disappointing. YMMV. With a little influence from the haze craze and a little more from west coast, the different ideologies about IPA converge with Evil Twin's juicy, foggy, bitter and dry IPA. Its a beer with a restless soul, simply wondering about the hopscape of beer. Lost Souls strikes the senses immediately with a radiant citrus and tropical tandem. While the nose is chocked full of branch ripe fruit, it also comes with light herb and spruce. Brightly colored with orange and peach hues, the frothy ale carries a nearly turbid haze to precede a succulently sweet malt taste of tropical fruit juice, honey, simple syrups and light caramel. As the ale begins to drop its biscuity sweet character, a hint of marmalade rounds on the middle palate before the bitterness and dryness of hops set in. Tangerine, red grapefruit, pineapple, mango and peach all swirl about the tastebuds, washing them in all things creamsicle, tropical punch and sherbet. Yet, the beer still manages to dry beautifully to a smooth but assertive bitterness laced with citrus peel, pine needles and a medley of chive-like herbs. Medium bodied but trending dry, drinkable and ultimately refreshing, the beer does a remarkable job of retaining hop aromas, flavors and gullet gripping bitterness without even a hint of astringency, burn or bite. 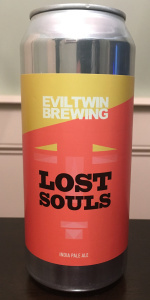 Lost Souls may be finding its way by bringing the San Diego bitterness and dryness to the juicy and fruity taste of New England styled ales. Poured into a Trillium glass a pretty nice cloudy pale orangy color, pretty nice carbonation, with a pretty nice thick/creamy one-finger plus white head, which also leaves some pretty nice sticky lacing behind. The nose is hoppy, malty, with a pretty nice citrus complex (orange, tangerine, grapefruit, pineapple, peach, mango), nice diesel like. The taste is pretty nice, hoppy, malty, with a pretty nice citrus complex (orange, tangerine, grapefruit, pineapple, peach, mango), nice diesel like. Medium body, ABV hidden very nicely, with a nice little dry/bitter finish. Overall, this one surprised me, a pretty nice take on a NE IPA. Addictive! Orange Julius! Nice to see it around here. A: The beer is a touch hazy light yellow in color and has a slight amount of visible carbonation. It poured with a finger high bright white head that left a patch of bubbles on the surface and lost of lacing down the sides of the glass. S: Moderate aromas of passionfruit and are present in the nose along with notes of peaches. T: The taste follows the smell and is packed with lots of fruity flavors of passionfruit, peaches and green grapes. O: This beer doesn't have the bite and crispness compared to IPAs but has very interesting aromas and flavors of a variety of fruits. I really enjoyed it. look: Hazy though not all that hazy. Looks kind of like apple juice. Big foamy white head and sticky lacing. smell: Bright tropical citrus nose. taste: Tropical citrus juice. A slight bitterness in the finish but mostly an easy drinking, juicy IPA. This one hits all the right notes for a Brooklyn based brewery making a NE style IPA; looks lovely and like grapefruit juice, smells like grapefruit and lemon zest, then it slides across the tongue with nice bitterness, fizzy carbonation and a ton of citrus pop. The flavor is a mix of grapefruit, lemon zest, souring orange juice, tart green apple, dank citrus hops, light piney notes, and then it shifts to coriander, peppery spices, biscuit, dry floral hops, chalky cracked wheat, dry flowers, tea leaf, earthy notes and a trailing caramel or graham cracker sweetness. Drinks real easy and completely hides the 7% ABV. Nice ET offering here. T: watery light peach juice. Some different spices hop flavors and finishing with a strange dirt finish for a light IPA. Poured into a Seattle Beer Week pint glass. Pours a very hazy, nearly opaque golden straw with a fine one finger white head with great retention and thick lacing. Aroma of pale malt, citrus and tropical fruit hops, lemon, orange, mango and a touch of green onion. Flavor is neutral malt, resinous citrus rind hops, orange, grapefruit, lemon, faint mixed tropical fruit with mango the most dominant. Lingering resinous citrus rind finish. Medium bodied with light creaminess. A NE style IPA with the now familiar opaque look and fruit forward taste. Lost Souls has more intense dry hopping and less distinct fruit flavors than most I've tried recently. Citrus is the main fruit flavor here and it is somewhat subsumed into the hoppiness. A good example of the style, but the hop profile is not my favorite with an emphasis on rind bitterness rather than fruit pulp.